Diesel fuel conditioner DBF-4 with lubricant - Prolab Technolub Inc.
DBF-4 with lubricant is the most complete and the best performing diesel fuel and heating oil conditioner on the market. Its exclusive super concentrated formula includes a synthetic organic compound which gives it full homogeneity properties with all types of diesel fuels and heating oils. The DBF-4 conditioner with lubricant is formulated with high quality ingredients. When used in a preventive fashion as an additive to diesel fuel, it keeps the pump and the injectors clean while protecting the environment by considerably reducing smoke emissions. DBF-4 continues to work where the competition stops ! The DBF-4 diesel fuel and heating oil conditioner dislodges sludge, completely dissolves water, varnish and gum build-ups, prevents rust and bacterial accumulations. REGULAR USE OF DBF-4 BRINGS ABOUT LOWER FUEL CONSUMPTION, BETTER ENGINE PERFORMANCE AND MORE EFFICIENT ACCELERATION. IT LUBRICATES INJECTORS. DBF-4 is non corrosive and contains neither metals nor any chemical that can damage diesel engines. The DBF-4 is recommended for ultra-low sulfur diesel (ULSD). Compatible for new engine using urea technology (D.P.F. / D.E.F.) DBF-4 meets the Canadian norm standard CANCGSB-3.517-2013 and European norm standard EN590. Use DBF-4 in all #1 and #2 diesel fuel vehicles and equipment. When used in heating oil, DBF-4 keeps the burner nozzles and the chimney clean. The DBF-4 conditioner can substitute without risk to any similar commercial product. Add DBF-4 to diesel fuel or heating oil. For maximum efficiency, we recommend the following dilution ratio : 1 part by 2000. For transport trucks with a 100 imperial gallon (455 litres) fuel tank: add 220 ml of DBF-4. For transport trucks with a 150 imperial gallon (682 litres) fuel tank: add 340 ml of DBF-4. NEW SIZE 210 ml: Press down, turn and remove tall cap and squeeze bottle to get required amount. Pour DBF-4 into diesel fuel tank. Close tighly container after each use. Car: 20 mL treats 40 litres. Light truck: 50 mL treats 100 litres. 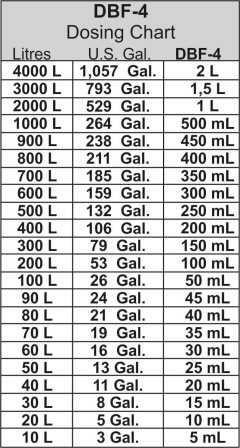 Heavy truck: 150 mL treats 300 litres. Refer to the detailed DBF-4 brochure for more information (comparative tests, results, pictures, etc.). Do not use DBF-4 in gasoline. Instead, use Prolab TGC-82.